Add another .57" to our rain total today, giving us 1.81" since the rain began yesterday at 3:00 in the afternoon. Today is National Weatherperson Appreciation Day! Go give your local weather guy or gal a hug! Today is also the 2nd anniversary of the Lafayette and Castalian Springs tornadoes. 22 die in what is the deadliest single tornado in 75 years. MORE RAIN: Look for the rain to continue today across the Cookeville area with highs only in the lower 40's. Temperatures fall tonight into the 30's and the rain may mix with or changeover to all snow after midnight. Lows tonight around 31°. For Saturday, snow in the morning. Overall accumulations could be as high as 1" with a change back to rain after lunch, high of 36°. Sunshine returns for Super Bowl Sunday! RAIN AMOUNTS: I recorded 1.24" of rain (at the 7:30 am observation) since it began around 3 o'clock yesterday afternoon. Across Tennessee, as of 7:30 this morning, a station in Cannon County (near Bradyville) reported 2.35". In Unicoi County, near Erwin (that is in extreme upper East TN), they recorded nearly 1" of new snow. They called it nearly 1" of new slush. Back here in Putnam County, the amounts have ranged from 1.10" to 1.24". Temperature at Sparta drops to -20, setting an all-time record low. Crossville's low of -16 sets a record low for February. One of the worst tornado outbreaks in Middle Tennessee strikes during the evening and early morning of the 6th. Fifteen tornadoes touch down across the mid state, including an EF-3 that kills 22 persons in Sumner, Trousdale, and Macon Counties -- the deadliest single tornado in Middle Tennessee in nearly 75 years. This is the 5th largest tornado outbreak in mid state history. 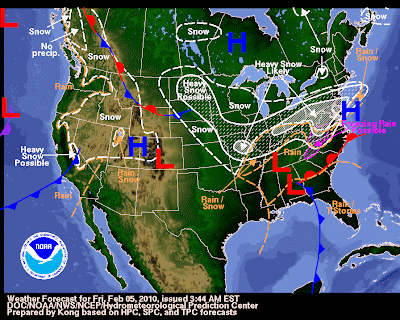 A very busy weather map today as two low-pressure systems will race up the Atlantic Coast. One is currently over Tennessee while the second is located in Southern Alabama. They will bring a MAJOR Winter Storm to the mid-Atlantic states, including Washington, DC today and Saturday. Some places could see up to 2 feet of snow. Check out the story on last weekend's snowstorm in Tennessee by Bobby Boyd from the NWS-Nashville.